Moisture analysers for laboratory and production processus. Moisture analysis and measurement of moisture content or moisture level in materials and products. Moisture analysis Moisture balances for determination of moisture content. Makes moisture measurement easy and offers fast and accurate results. 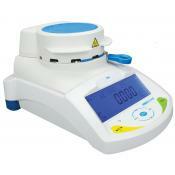 Moisture analyzer, plastics Aboni HydroTracer, moisture analyser for plastics, granules, film, powder, etc. Easy operation. Water potential meter The water potential in a crop is a clear indication of water excess or deficiency, and thus the water absorption ability of the crop.